There are various cooking tools in the market that have made life easier and effortless. Magic Opener has come up with the special bottle openers in the market. Since the introduction of the tools, it has always been the most functional and important tool for cooking today. You will get to enjoy the convenience and practicality in using the ergonomically designed tools when opening any cans or bottle caps of beer, soda or juice. You will immediately find out that the Magic Openers are the excellent and it really works like magic. The Magic Openers are the perfect beverage openers. And because of its multi tasking ability and excellent performance, the tools are being used in many ways and at different venues. Most people are purchasing the products that are convenient to use in restaurants, homes and bars. Our specially designed products are best for weak people and those suffering from Arthritis. Without these tools cooking might be frustrating chore for those people who do not have enough hand strength, because they need frequent opening of different cans and bottle caps in order to accomplish the work properly. The cooking tools have made handling daily cooking activities easier for everybody. Magic Openers are boon for those suffering from arthritis, physically challenged and senior citizens. Such helpful tools are easily accessible at economical rates for all now at Magic Opener. Purchase these wonderful cans and bottle caps opener to experience the difference in daily cooking activities. The Magic Openers of innovative ergonomic design is very useful invention of our company that make difficult bottle opening task easier and gentle. The smart accessories are easy to handle and store because each one is equipped with a magnetic back so that you can place it in an easy to reach and easy to find place. Place it on any metal surface where the magnetic back can stick properly. These cooking tools are extremely convenient to carry while traveling, and they are also perfect to use in parties. 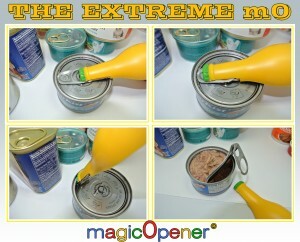 With a Magic Opener anyone can easily open bottles caps, juice and beer cans, and soda cans. The multi-purpose tools have made it difficult to open bottles and cans easily. Most people like to have one handy and useful tool everywhere, whether at home, office or party. Purchase the wonderful cooking tools from Magic Opener. We provide creative and stylish bottle openers of different colors to make your life convenient. Customers are satisfied with the exceptional products of our company. The Magic Openers are durable and we offer our products with lifetime warranty. Get the best Magic Openers at the best price from us to ease most of your cooking activities.